Interestingly, in some species of booklice, only females are present and immatures develop from unfertilized eggs, a process called parthenogenesis. Both male and females are present in some species. Females lay eggs which are either bare or encrusted and may sometimes be covered with webbing. 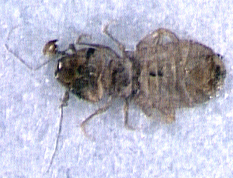 Immature booklice, called "nymphs", look very similar to adults but are much smaller. There are four to six nymphal stages. Booklice feed primarily on microscopic fungi and mold. Therefore, they are most often found in damp, dark areas. Such places may include basements, crawlspaces, kitchens, leaky plumbing, unvented storage areas, and around over-watered houseplants. They may also show up in recently built homes where they entered during construction and were enclosed in a wall after siding and sheetrock were installed.